At the Media Architecture Biennale 2014, the world’s most outstanding accomplishments in the intersection between architecture and technology were awarded. Common features of the five winning projects were not only their aesthetic and technical qualities. Also the ability to integrate different layers – and to have an impact on people and cities – were qualities of the winners. 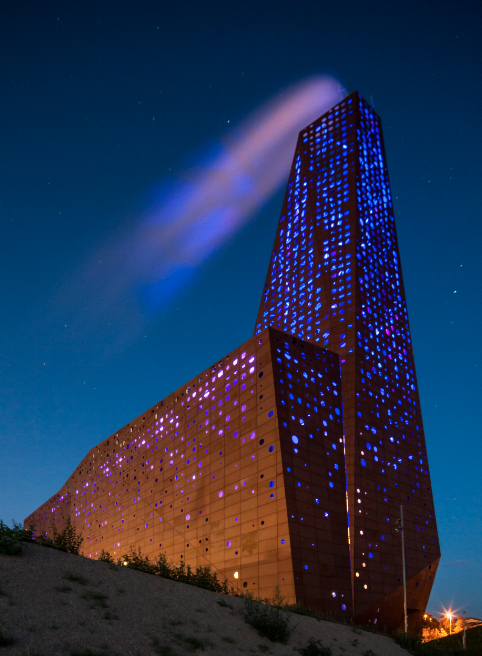 A Danish power plant turning into a glowing landmark. Huge 3D selfies at the Sochi Winter Olympics. Korean phantoms of light in a spectacular, light-based work of art. 80.000 LEDs allowing people in Copenhagen to interact directly. And a whole new look at public transportation in Nairobi. 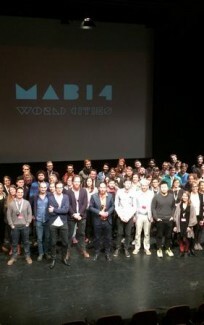 The teams behind the five distinctive projects received their prizes at an well-attended award ceremony on November 21. 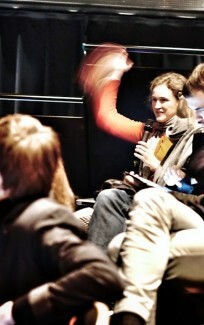 It took place in connection with the 2014 Media Architecture Biennale in Aarhus, Denmark. 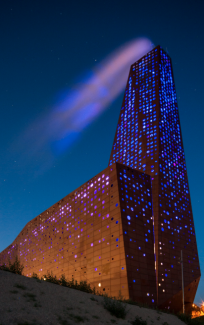 The content referred to by Dr. Tscherteu symbolizes the plant’s incineration process: Several times per hour a small sparkle of light on the façade matures into a huge flame lightening up the otherwise dark building. The effect is enhances by light painting the smoke from the chimney various colours. Gunver Hansen, lighting architect on the power plant project, received the award on behalf of the entire team behind: Gunver Hansen, lighting architect on the power plant project, received the award on behalf of the entire team behind: the well-known Dutch architect Erick van Egeraat, Gunver Hansen Tegnestue, and Martin Professional. The next chance to win a Media Architecture award is in June 2016, when the biennale will take place in Sydney, Australia. The façade is designed by Erick van Egeraat and consists of two layers: The inner layer is the ‘skin’, providing the actual climatic barrier and allowing the second layer to be treated more freely. This second layer is made of raw umber-coloured aluminium plates with an irregular pattern of laser cut circular holes. The plates are treated to give them the desired colour and patina at day time. At night, the programmable lighting, installed between the two facades, gives the building an additional metaphor, and lights up surrounding Roskilde as a new and already popular landmark. The architectural concept of the façade lighting designed by Erick van Egeraat was identified and implemented by Gunver Hansen with the lighting solution, provided by Martin Professional. Kimchi and Chips create phantoms of light in the air, crossing millions of calibrated beams with their work Light Barrier. This light installation creates floating graphic objects which animate through space as they do through time. ”They tell a story only using light. That’s very interesting,” Dr. Gernot Tscherteu said in when explaining why this project won a category with many strong submission. Light Barrier was co-commissioned by FutureEverything and The British Council. 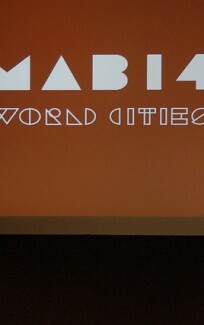 It premiered at New Media Night Festival in Nikola-Lenivets, 2014. In May 2013, The Confederation of Danish Industry (DI) moved back into their rebuilt headquarters in the heart of Copenhagen. The extensive architectural task has been carried out by Transform who has redesigned the physical manifestation of the DI. The different designs have been turned into generic light plugins that fit into Kollision’s player-system. These light plugins can be controlled by the graphical department at DI who can tweak and modify parameters like speed, colors, and direction creating thousands of different expressions. All these light designs can be previewed in the 3D player system displaying each of the +80000 LEDs. The system holds potentials for adding interactive components, allowing the citizens to interact directly with the façade. Technology is transforming the way we relate to transit. Digital Matatus is a key player in the movement to make transportation in the developing world more efficient, and open. A collaborative project of the University of Nairobi, Columbia University’s Center for Sustainable Urban Development, MIT’s Civic Data Design Lab, and Groupshot. Digital Matatus has developed and deployed purpose-built mobile phone apps to more efficiently collect location data of Nairobi’s buses. They have used the information gathered through this crowd sourcing method to produce standardized bus routes for the city, now assembled together and made available in a full city-wide bus map released to the public in January of 2014. MegaFaces Pavilion is a structure incorporating the world’s first large scale actuated LED screen / kinetic facade conceived by Asif Khan and engineered by iart at the Sochi 2014 Winter Olympics for MegaFon. Formed by 11.000 actuators, the kinetic facade of MegaFaces is able to tranform in three dimensions to create visitors’ faces in Mount Rushmore-style monumental scale. Facial impressions are relayed to the facade from 3D photo booths within the building and across Russia. A queuing system manages the data and visitor names are displayed on screens indicating the time their face will appear.